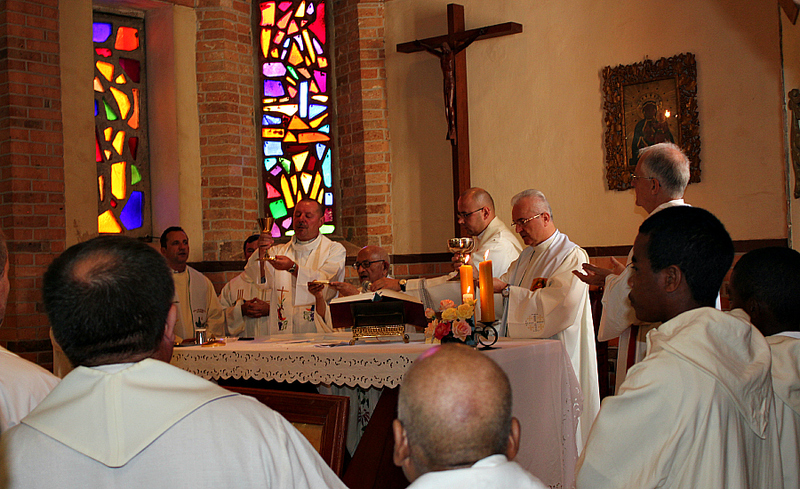 The celebration of Blessed Father Beyzym 100th anniversary of death was planned on Sunday, October 14, 2012 in Marana. 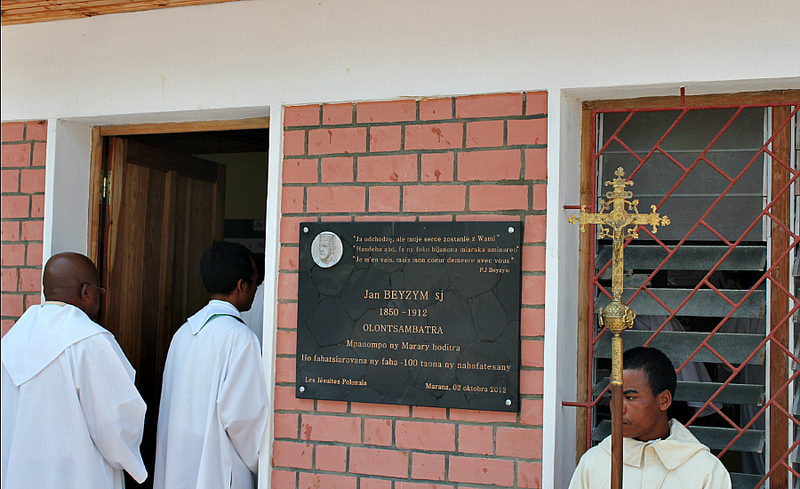 Prior to this event, on June 23, the stele, commemorating the work of Father Beyzym in Ambahivoraka, was unveiled. 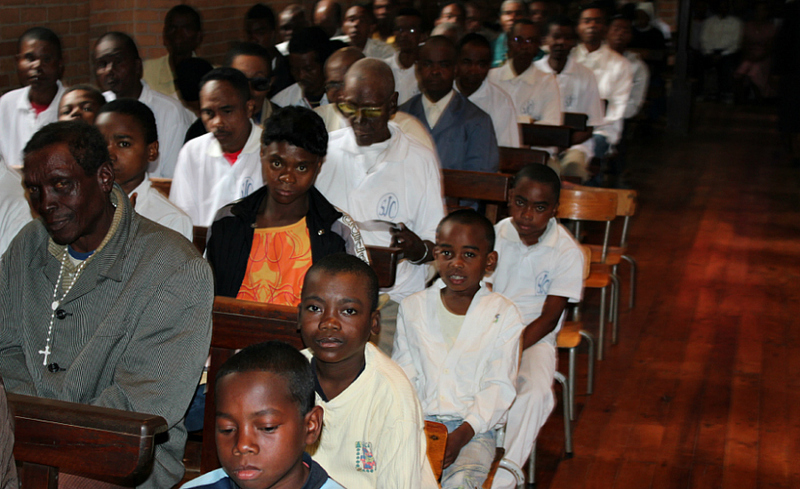 Ambahivoraka was the leper asylum, where Father Beyzym was sent after his arrival in Madagascar. 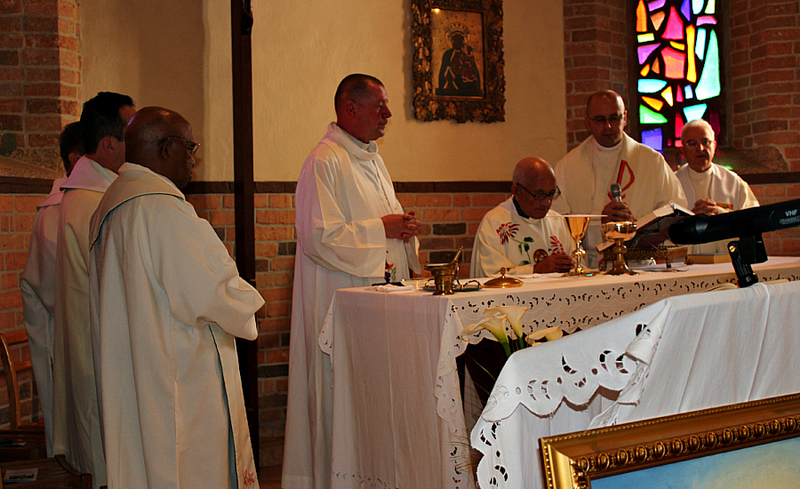 Father Wojciech Ziolek SJ, the Provincial of South Poland Province of the Society of Jesus took part in the celebration. On Friday, October 12, 2012, the day of Blessed Father Beyzym’s liturgical memorial, Father Jozef Pawlowski SJ, Father Tadeusz Kasperczyk SJ and me went to Marana to pray together with Marana community at the tomb of the Servant of the lepers. 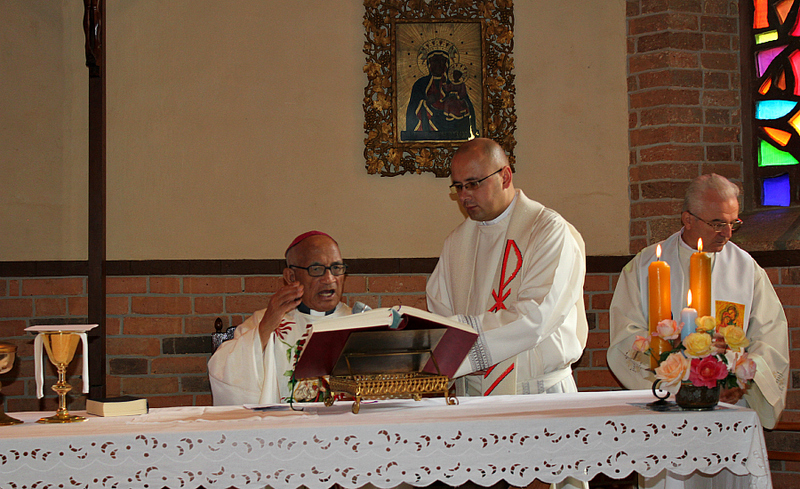 We celebrated the Solemn mass with Father Michal Rabialahy SJ, the chaplain and spiritual guide for Marana. 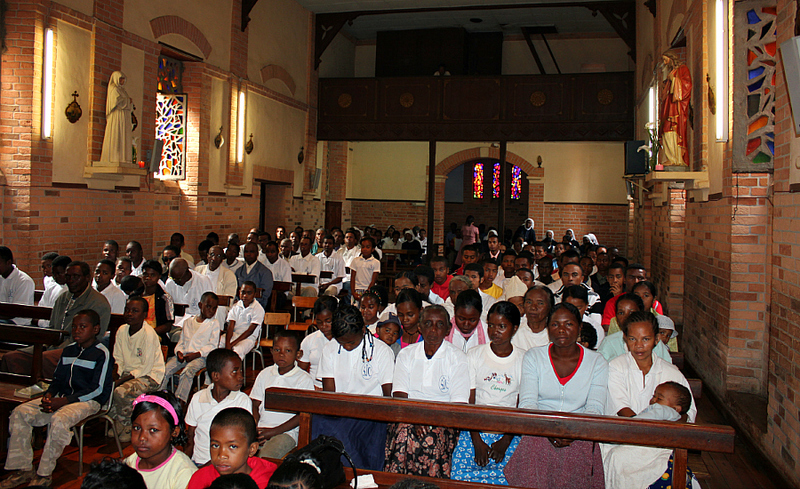 The Sisters of St. Joseph of Cluny and the leprosarium inhabitants participated in the mass. After the mass the sisters invited us for breakfast. The Malagasy people usually eat rice and drink coffee for breakfast. Ours was more French-European version - white coffee with or without sugar, a baguette, they are baked on Madagascar nowadays, a banana and orange jam. We were also treated to something very special - the litchee flowers honey. I would have been happy to take such a treat to Poland for my friends to try! But having only one small jar as a present from Morondava, the sisters did not have honey to go. Following the baguette with honey and coffee, was some home made yoghurt or a banana from Marana garden. After the breakfast we visited the creation of Blessed Father Beyzym - his hospital. 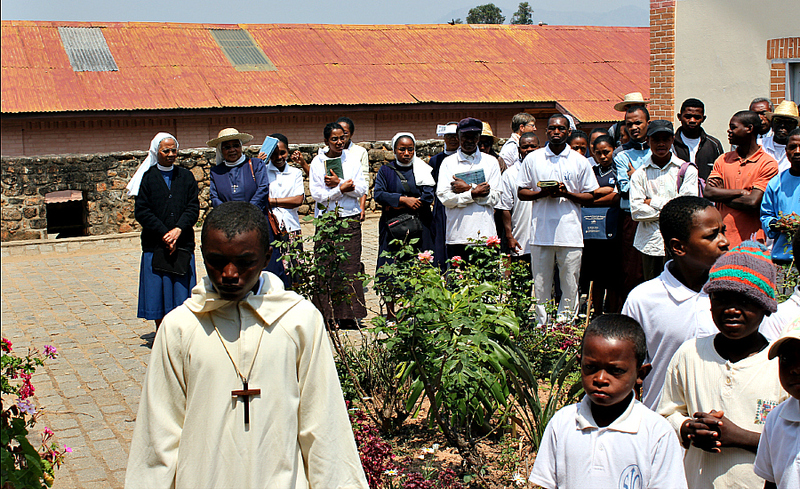 I followed Sister Catherine, who was showing to us and telling us about the hospital. In my desire to capture all around, I was taking pictures of everything I could set my eyes on. Pavilion for women was exactly the same as Father Beyzym built it. The hall of residence includes the sleeping area, the sewing workshop, the kitchen, where the patients prepare food in the homely atmosphere created by the singing, talk and laugh of their children. 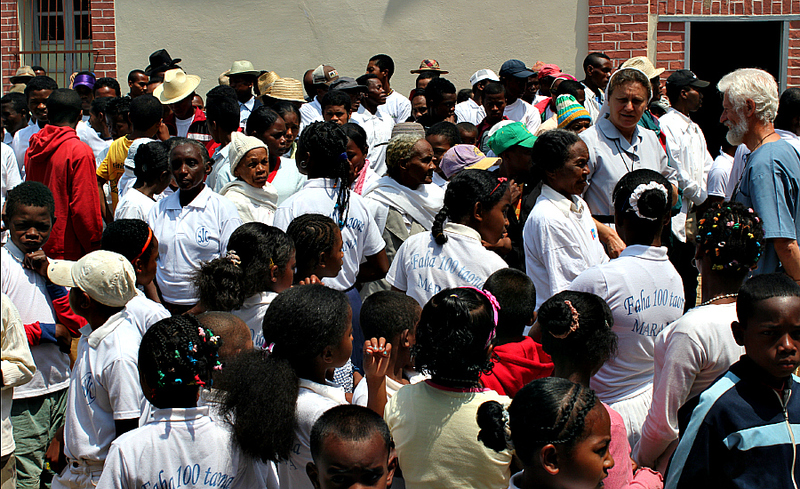 The next is the infirmary, where the patients get their daily portion of medication and their dressings applied. 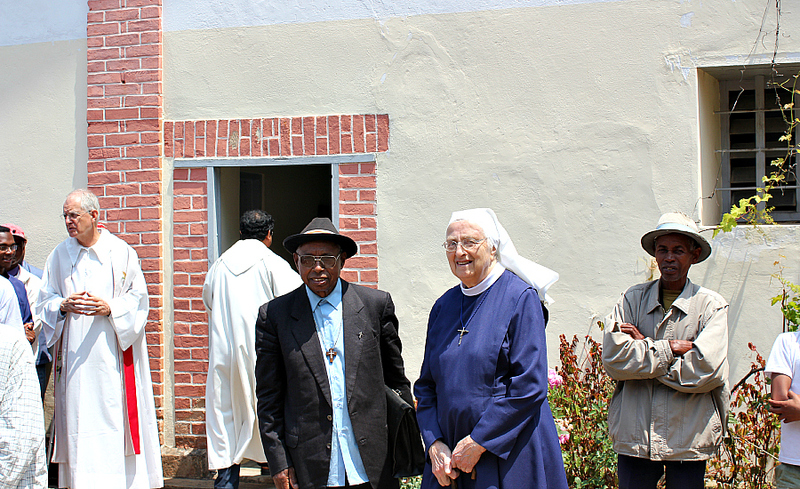 After leaving the women pavilion, Sister Catherine took us to another pavilion with a patio. It was the pavilion for men. It also has a big sleeping area. The bedside cabinet for personal belongings is next to every bed here and in the pavilion for women as well. There is a fitter’s and carpenter’s workshops and a kitchen there. There is also an infirmary for the patients to get the medicine and their wounds dressed. The shoemaker’s could be found there as well. They make footwear for the patients there. The shoemaker is a former patient, who after learning the occupation, makes the orthopedic footwear for the lepers. Next we visited a local museum established by Sister Catherine. 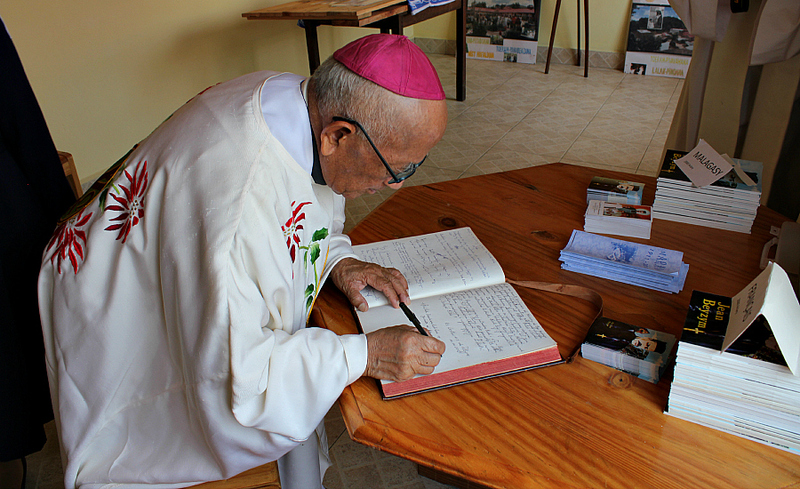 The museum is still in the course of development but one can see a lot of pictures of Father Beyzym there, taken during his life on Madagascar. Before leaving Marana, we visited Father Beyzym’s house. 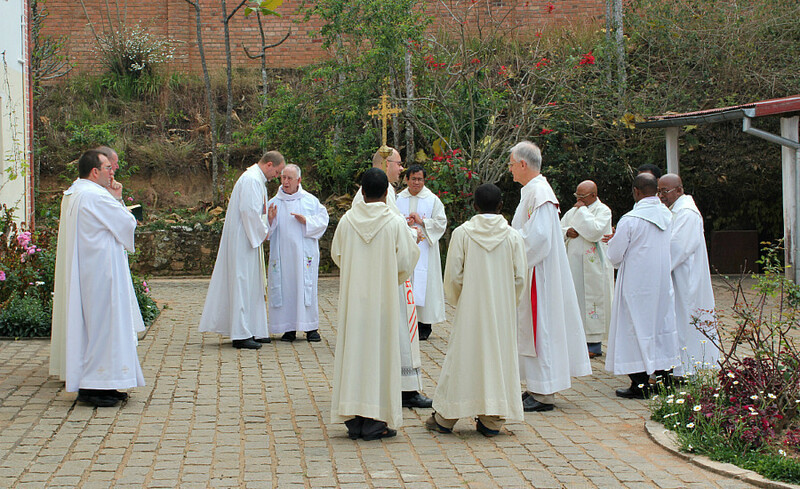 The feast for our eyes was the panorama of Fianarantsoa with St. Francis Xavier College in the distance. And last but not least, the picture by the oak tree. The oak is not as huge as in Poland, the climate is unsuitable - too hot, but it is said that the tree was planted by Father Beyzym himself. When we were ready to go, three children approached us. They were telling us something in Malagasy timidly holding out some pieces of slightly crumpled paper, some kind of “envelopes” with the pieces of banana leaves glued to them. The children made those so called “cards” themselves; they simply glued banana leaf cutouts on the envelopes. They gently asked us to buy their handiwork. It was the beginning of the school year but they did not have money for the notebooks or other school supplies. Making those primitive cut-outs they tried to earn “a few pennies” for the necessary supplies. 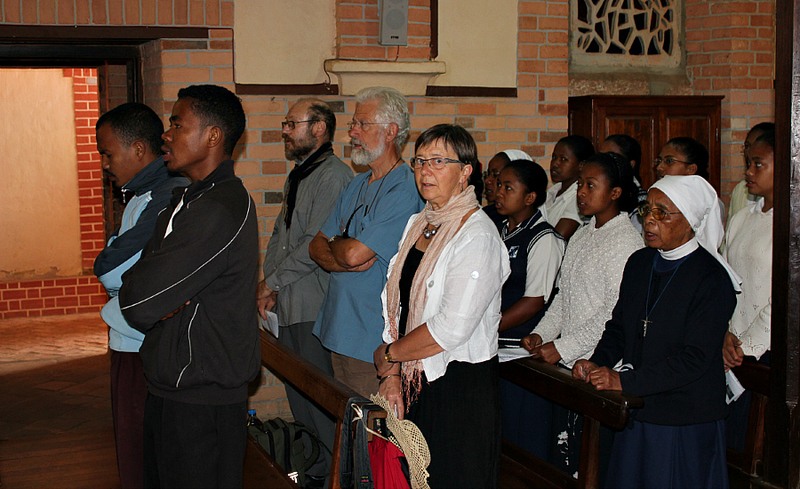 Well, the children had to be helped… And we returned to Fianarantsoa. On Sunday, October 14, at 6.30 in the morning we came back to Marana. 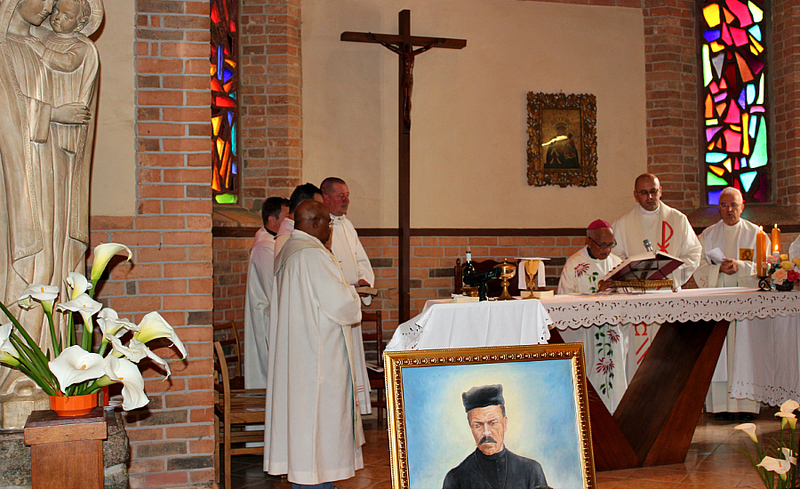 This was the day of a great solemnity in Marana - the celebration of the 100th anniversary of Blessed Father Beyzym’s departure to the Father’s house. 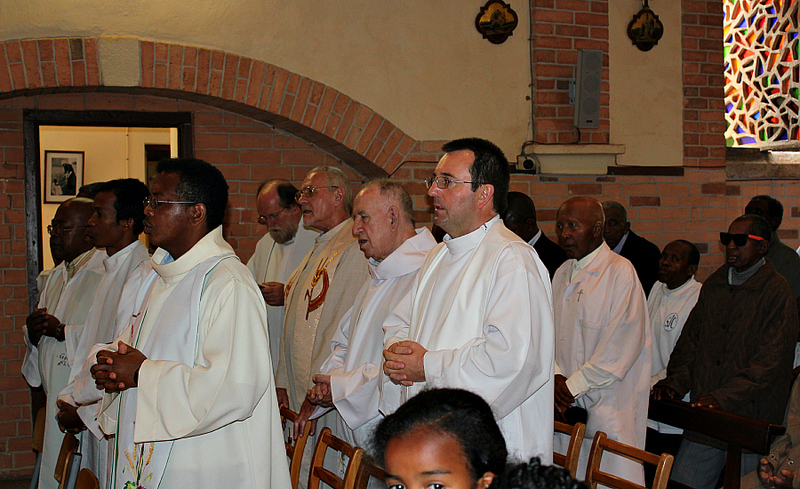 The Mass was concelebrated by 20 priests, half of them were Poles. 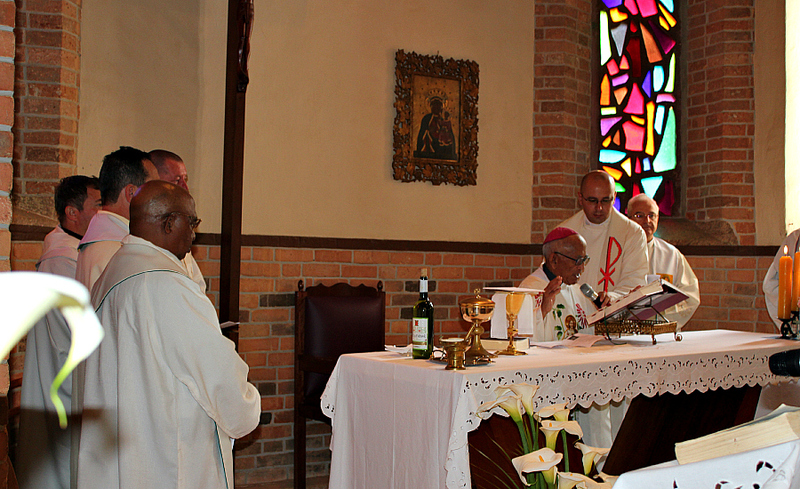 Archbishop Senior from Fianarantsoa Philibert Randriambololona SJ presided. 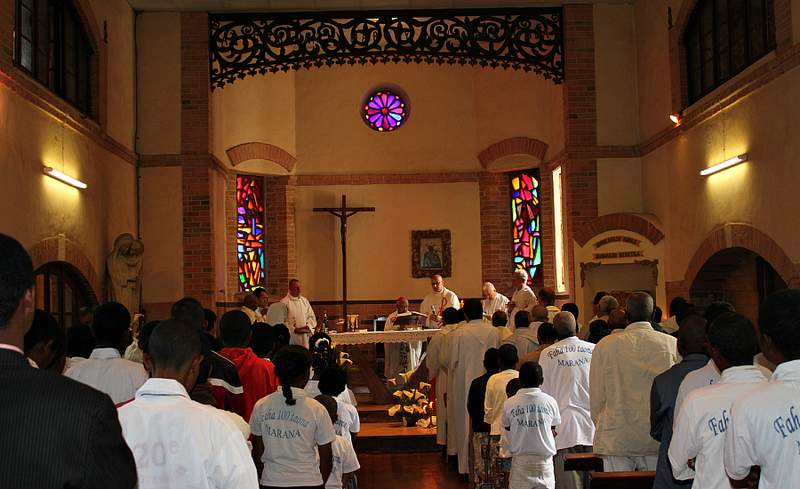 The patients and inhabitants, Sisters of St. Joseph of Cluny, who came from France in 1911 on Father Beyzym’s request to look after the lepers, were gathered in Marana chapel. 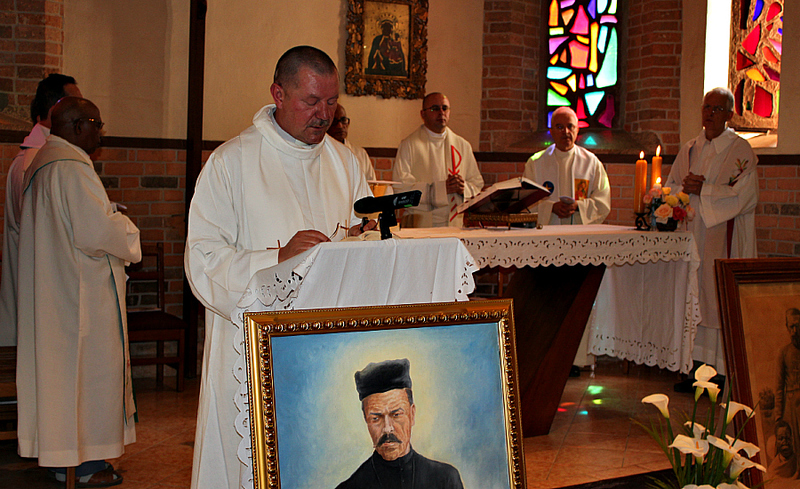 Before the Holy service the Bishop blessed the painting of Blessed Father Beyzym. The painting was the present of Ms. Dorota Koziol. Ms. Dorota Koziol was the painter of the image and the author of a recently published book about Father Beyzym titled “Polish Samaritan”. After the Mass the Bishop blessed the commemorative plaque memorializing the deed of Father Beyzym and consecrated the inaugurated museum. 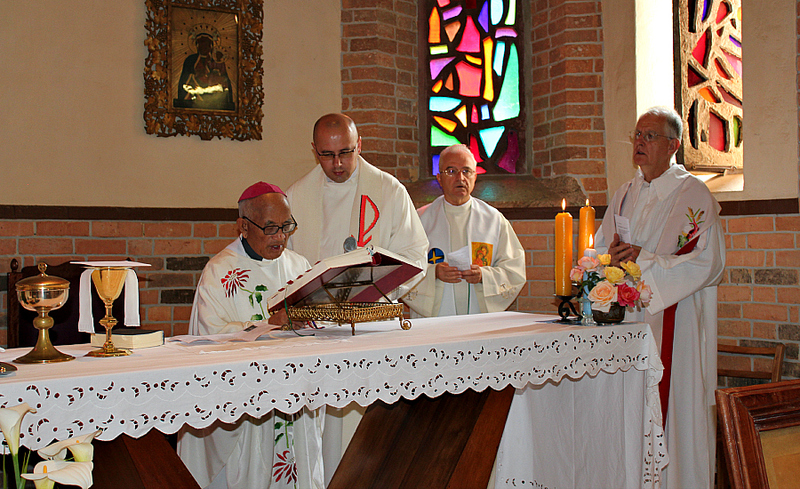 The entries made in the book of remembrance were the conclusion of the solemnity. In the process of reflection on today’s first reading, listened to a minute ago, the following question arises: To what is a man attracted the most in this world? We may answer - a man wants to get to power so that he could quickly run into money. A man wants to become rich, to make a fortune, to accumulate gold, silver, gem stones and everything “that glitters”. We should not miss the health and beauty. But will all that last forever? The virtue, that is above all the material wealth, is not gold, not even health, but sense and wisdom. Out Lord in His omnipotence can give us the wisdom. And this wisdom is nothing else but God himself. God is the only wisdom. Love, Power, Wisdom, Holiness - all is focused in one word - GOD. All that is beautiful is God. That is why prudent people choose God. A young man asked Jesus: ”Good Master, what shall I do to inherit eternal life?” And Jesus said unto him: “Why do you call me good? None is good save one, that is God”. The young man, who calls Jesus good, thus recognizes Him as God that is Goodness. 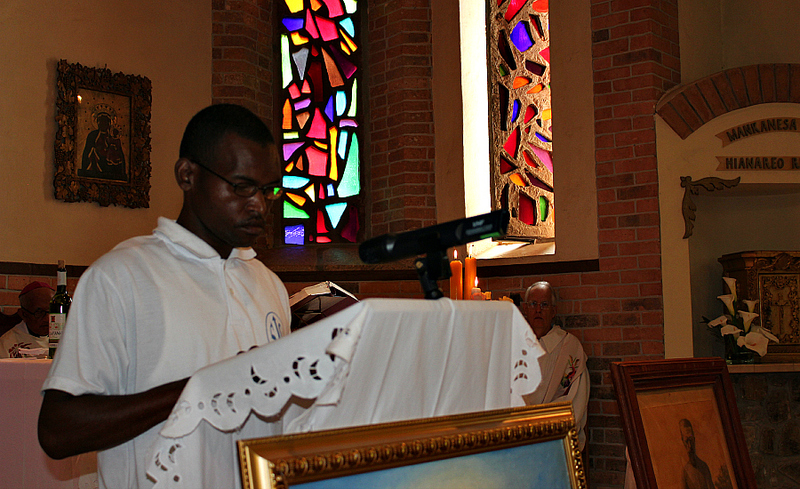 “If you want to inherit eternal life”, - Jesus says, - “you know the Commandments: do not commit adultery, do not kill, do not steal…” The young man answers that he has been obeying the Commandments since his childhood. All his life he has observed them. Jesus looks at him with love but it seems that He wants more from the young man. Jesus says to him: “There is still one thing left for you: sell all that you have and distribute it to the poor, and you will have a treasure in heaven. All you did will not be forgotten but will be transformed into treasure”. And Jesus said: “Then come, follow me!” When the young man heard this, he became quite sad, because he was very rich. He owned gold, cattle, sheep, lands; he became a victim of his wealth. Sadly he went away. But, in sober fact, he does not know where to go. It is impossible for a man, but not for God. In this case one needs to follow Jesus to get all that. Apostles gave up everything because they got God’s wisdom. Everyone who has Jesus has everything else. Everything on the Earth belongs to Christ as He himself is a Creator of everything. If we are with Him, we have everything in Him and with Him. Those, who follow Christ, become owners and successors of everything that is His. They become as free with regard to the tangible wealth as Christ is. Those, who follow Jesus, make use of the material wealth here, on Earth, but are free of it, because they are in communion with the Father Creator and Holy Spirit. Blessed Father Beyzym was the man, who possessed that wisdom. He had Christ in his life and understood His wisdom. Blessed Father Beyzym understood and got Christ in his life and that is why the diseased became his family, friends, brothers and sisters in Jesus Christ. Father Beyzym is one unit with Christ and that is why he is a happy man, which means blessed. The Polish missionaries, who are present here now, follow his steps. God gave us Father Beyzym as an example for all of us. 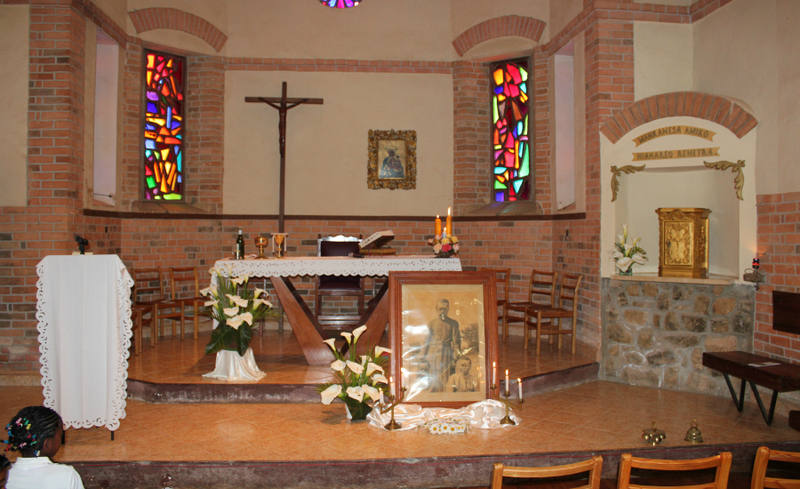 Father Jan’s wisdom is implanted by God into the Polish land, into the hearts of missionaries. Those, who want to follow Jesus, love Him, but the love for God is inseparable from the love for a man. To love the Lord is to love your fellow man. Just as Jesus, who gave His life for us, so is Father Beyzym, by giving his life to God, dedicates himself to the lepers, because he loved Jesus in his fellow men. He cherished the love of Christ and thus, he achieved the eternal life. If we want to achieve the eternal life, we should plead for such love. Father Beyzym dedicated his life to lepers, as he loved Christ and understood His logic. We should plead to God, who is Love, for such love. God, who is Love, opens the Heaven for a human being, but not the material wealth, gold or silver. The only legacy in the Heaven is love but not the material wealth. Saint John says: “God is love, and all who live in love live in God, and God lives in them. And this commandment we have from him: whoever loves God must also love his brother, for the Love that is God cannot be divided”. Dedicating himself to the lepers Father Beyzym, therefore, preached the Gospels. Blessed is someone, who lives in God and God lives in him. Father Beyzym is just the man. He lives in God and God lives in him. The way we live on the Earth, the way we behave, allows us to get the life in the Heaven. If here, on Earth, we live in unity with God, we are with Him in our future life. If there is no God, no Love in the life of a man here, on Earth, there is no Love, no God in the man’s future life. There is no point in such life. The life in the Heaven is life with Him and in Him. We thank God for the life of Father Beyzym, who is our teacher and example to follow. He teaches us how to live by deed not by word. He is happy there, in the Heaven, looking at us sharing the joy and love, us, the witnesses of God’s love. It is the most important task: to make an effort to live everyday of our lives in mutual assistance and in mutual love. And God is happy seeing us, as the task, which was given to Father Beyzym, is being fulfilled de die in diem. 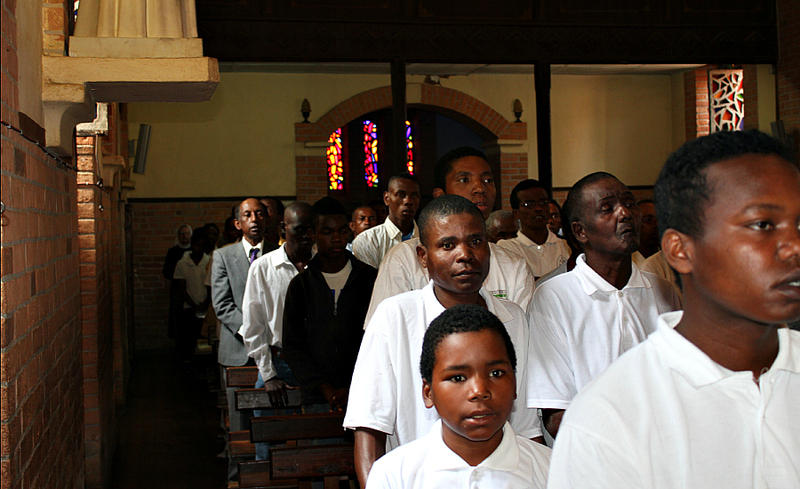 Christ called the Disciples to follow Him. Father Beyzym followed Christ in the same way. Christ chose Father Beyzym, loved him and lived in him. God is Love. If we cherish mutual love, God lives in us and we live in Him. Amen.